Beef pho is a traditional Vietnamese soup made with beef broth, rice noodles, spices and thinly sliced beef. Some recipes also call for vegetables, such as snow peas and sprouts. 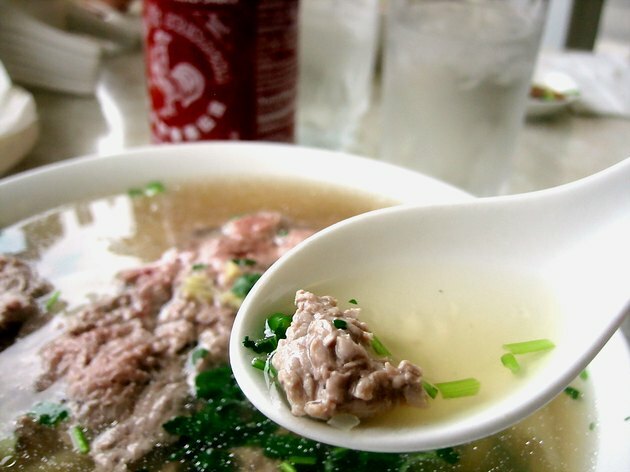 Diners often consume beef pho on its own as a meal. Opt for a smaller portion if you want to use it as a starter to avoid going over your recommended calories for the meal. A 1-cup appetizer portion of beef pho has about 176 calories. Larger, meal-sized portions range in calories from approximately 274 to 389 calories, depending on the ingredients used. You can use brown-rice angel-hair pasta in place of rice-stick noodles to make a healthier whole-grain version of beef pho with about 375 calories per serving. Using deli roast beef in place of flank steak or beef tenderloin speeds up the process of making this soup but increases the calorie content per serving.